Nate has awakened in a dark cell, a mystery man offering his help is his first sight, but Nate is stunned and confused so he runs, he has escaped from his imprisonment. Then he appears in the remains of a luxury mansion, he sees two men arguing. What´s happening? He can´t recognize anything. 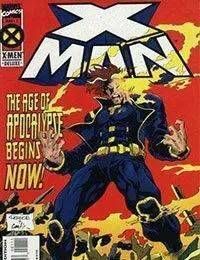 It was all a recreation of his own past, the mysterious past of one of the most powerful mutants all over the world. Forge and a group of outcasts have hosted Nate as a family since they found him. Impersonating a theatre troupe they have been destroying Apocalypse´s minor goods like a small anonymous oposition to the dark lord. But Apocalypse has been aware of Nate´s existence thus he sends his most trusted assassins.